The cave of Saint Sofia is one of the three known caves in the area of Kythera. The other two, also known as Caves of Saint Sofia, are in Kalamos and Agia Pelagia. However this cave is far more interesting, and the only one organised as a tourist attraction. The Cave of Saint Sofia has been used and became known as a place to practise religion. Moreover, we are confident that the cave of Saint Sofia has been used for religious purposes for the last 800 years. According to mythology and recent research Paris and Helen of Troy were hidden within the cave after leaving ancient Sparti. According to mythology they got married in the entrance of the Cave. The Cavern of Saint Sofia is now generally known as one of the mythological caves of the world. 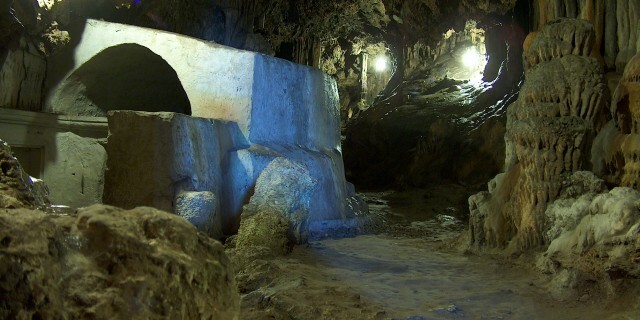 Many scientists attempted to fully explore Saint’s Sofia cave. However, it became generally known in 1930, when a Kytherian speleologist, Ioannis Petrocheilos, made the first systematic attempt to explore the interior of the cave. In 1970, his wife, Anna Petroxeilou has finally developed and analytically mapped the interior of the cave. The size of the cave is 2200 square meters and the distance from the beginning to the end is 500 meters, whereas the tourist route is 200 meters. The cave is 60 meters above the sea level and 20 metres deep in the ground. In this cave we can see various formations of stalactites and stalagmites and colours that vary from white to black and different shades of red. The different colours are a result of the metallic ingredients and chemical constitution of the area.